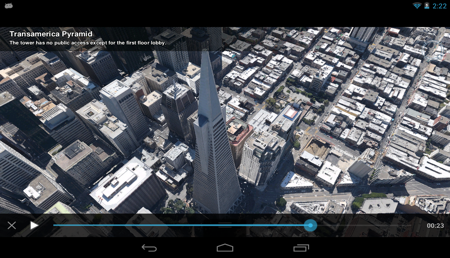 on Google Earth for Android for a select number of initial cities, including San Francisco, Los Angeles and Rome. Along with the availability of more comprehensive and realistic 3D imagery, we’ve also included a new tour guide feature in this latest release. Taking a virtual trip to places such as Stonehenge in England, Brandenburg Gate in Germany, or the Great Wall of China has always been possible by typing a location into Google Earth; but how do you know where in the world you’d like to visit if you are not familiar with an area? The new tour guide allows you to discover and explore interesting places around the world, even if you didn’t know to search for them. It is already available on Google Earth for Android, and an update to Google Earth for iOS will be coming soon. We invite you to embark on any of the more than 11,000 tours of popular sites in over 110 countries and regions, from famous landmarks to scenic treasures. 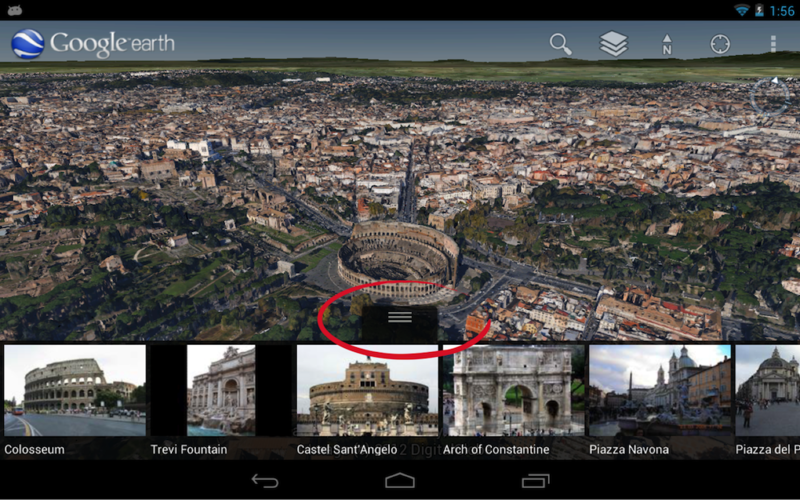 You can open the tour guide with a quick swipe of the tab located on the bottom of the main Google Earth screen. Thumbnails of available pre-created tours will dynamically update with interesting locations in your current view. Simply click the thumbnail image to start the tour and begin your online adventure of discovering new and exciting places around the world. Where available, the tours include 3D models for the most realistic experience possible. Information from Wikipedia also provides more information on famous sites, so you can learn more about the places that interest you as your virtually fly over them. The tour guide also includes user-contributed Picasa and Panoramio photos as thumbnails for a preview of the featured location. 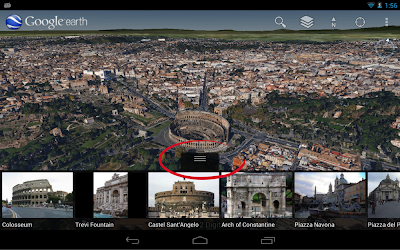 To get started, update Google Earth on your mobile device. Happy touring! This week we announced new 3D imagery on Google Earth for Android for a select number of initial cities, including San Francisco, Los Angeles and Rome. Along with the availability of more comprehensive and realistic 3D imagery, we’ve also included a new tour guide feature in this latest release. Taking a virtual trip to places such as Stonehenge in England, Brandenburg Gate in Germany, or the Great Wall of China has always been possible by typing a location into Google Earth; but how do you know where in the world you’d like to visit if you are not familiar with an area?